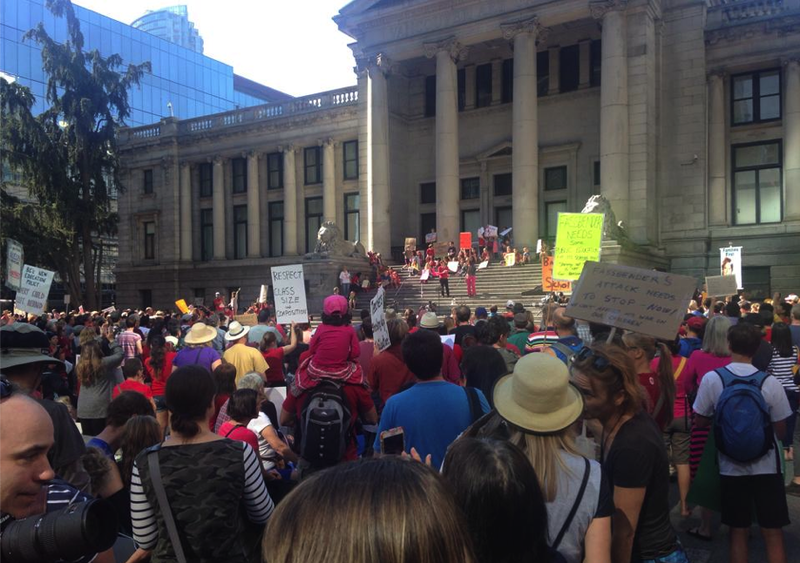 Parents rallied today at the Vancouver Art Gallery in answer to the Liberal Government's refusal to enter binding arbitration as a way to finally end the four months-long teachers' strike. Don't believe the CBC nonsense about it being violent and anti-union. It was fantastic. 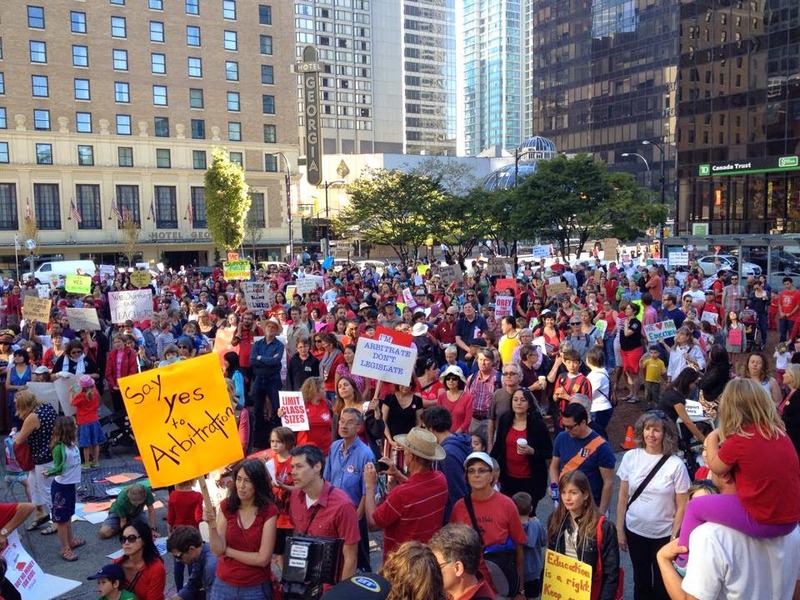 The rally was pro-teachers, pro-education and pro-getting students back into classrooms. Approximately 2000 people joined together to speak up for our kids and the future of education in this province. The organizer, Catherine, was kind enough to allow me a few moments on stage to ask three important questions of Christy Clark. Questions the media is just not asking. My being up there was totally unplanned and my comments were impromptu but I remember these questions clearly because I have been wanting answers to them. So have my friends. So have teachers. 1) Christy Clark and Peter Fassbender, if you wanted a negotiated agreement and kids back in class as you say you do, why did you wait until the very end of summer to get back to the bargaining table with teachers? 2) You keep talking about affordability. Why is it okay for teachers in other provinces to make as much as $20 000 a year more and admittedly work less than teachers in British Columbia? Other public sector employees in this province have received 2%-3.2% salary increases (7.6% for your deputy ministers), yet B.C. teachers are fighting just to get 1.6%. That's not the affordability zone. That's the inequality zone. I also spoke about hovering around the poverty line for the first ten years of my childhood. But in the public school system, I was treated as an equal. And I was given the same opportunities as everyone else in spite of my socio economic background. I said that this current strike isn't just about education. It's also about worth. Our children are one of society's best resources and I challenged Christy Clark to start valuing them. I may have said some other things but by then I realized I was standing in front of 2000 people with Grizelda hair and not a stitch of make-up on. What I won't do for my kids... Hope the pink pants made up for it. In the end, I think I said that our kids and our teachers deserved better. And I genuinely believe that. Thanks again to everyone who organized and attended. What an incredible turn out. Public education is a right. But being a part of this community is a privilege. Speaking at the rally in Vancouver. 2000 parents, students and teachers attend rally. Wow, those are great questions! And you aren't a teacher? You definitely understand what's going on. Thank you for your support. Just a FYI The group standing next to me all agreed - if you run for office, we'll vote for you! Fantastic words and awesome pink pants! I looked for you at end of the rally to tell you in person - so very happy to find you here. Carrie, you are so incredibly kind. Thank you! But I have awoken from my apathy and I genuinely want to serve my community as part of the community, rather than as a politician. With you on the distaste for politics. And yes, I would worry about the pink pants rules too! Thanks for your advocacy! I am celebrating today. Can't wait to see my students back where we all belong.